Woven by Words: Faith 'n Fiction Saturday: Anticipated Reads for 2009!! Faith 'n Fiction Saturday: Anticipated Reads for 2009!! Today's Question: There are a lot of great new books being published in 2009! But which ones are you the most excited about? Please pick some Christian fiction books you are excited to read this year and tell us all about them! But just to give this a little twist...be sure to visit everyone else's posts and find some books you might be interested in reading as well that are different from your picks! It will come in handy for a fun bonus question next week! I know those of us who are doing this question will think I nabbed Amy's first choice, but as soon as I saw the topic of the question I had my 1st book in mind. I hadn't had a chance to see Amy's choices since I found the question on my Dashboard. The following books are in no order of preference. I'm just searching and finding and putting them on my post! To check out the authors sites, click on the picture of their book. Hopefully all the links will work! I'll try checking them out when I post. My list isn't exhaustive either. I'm sure that I'll visit other sites and realize, "Darn it, I meant to add that book, too!" The first book I'm looking forward to read is not surprisingly Julie Lessman's book A Passion Denied. Julie's first two books have been fantastic. Not only is Julie a fantabulous person, she a strong author! I know that my bookshelves will probably carry every single one of her books someday and my goal is to have each one signed by her! Meeting her at the ACFW conference this past fall was such a blast. She is genuine and I love that about her. One of my all time favorite authors, Cathy Marie Hake will be releasing That Certain Spark in August 2009. Cathy is so amazingly funny in her writing! My girls and I absolutely adore her characters. Her last book Forevermore had us laughing out loud. Cathy is known to write "hysterical historical" fiction. That is dead on. I met Cathy at a book signing at Northwestern Bookstore before the ACFW conference and it was such a blessing to spend time with her. Her heart for the Lord is worn on her sleeve. If any one of her books can change the life of one person, she knows she has done what the Lord has asked of her! How awesome is that? My next book that I'm looking forward to is Robert Liparulo's 4th book in the Dreamhouse Kings series Timescape. I just finished reading and reviewing Book 3 The Gatekeepers. What happened at the end of Book 3 wishes I had an Advanced ARC (yes, double advanced)! I thoroughly enjoyed Hannah Grace by Sharlene MacLaren. So, I can't wait to read Maggie Rose this summer. It's supposed to come out in July. I checked the publisher's website and Sharlene's but didn't fid a pic of the cover. So, there's a lot of anticipation for this summer and this book. I love historical fiction and she picked a fantastic period in time. Tina Ann Forkner has her 2nd novel coming out this year. Rose House will be coming out in May. I really loved Ruby Among Us, her debut novel. Set in the lush Sonoma Valley, this book will draw you into the beautiful surroundings of the wine country. Tina was a dynamic person at the ACFW conference! It was so much fun getting to meet her! Oh, and I still think she's a snazzy dresser! 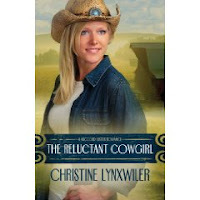 The Reluctant Cowgirl by Christine Lynxwiler is to be released in April. I already have this book on my TBR pile at my Shelfari page. My girls and I really enjoyed the first two books of Christine's that we read this year Along Came a Cowboy and Promise Me Always. Christine has a fantastic sense of humor and it comes through in her books. If you haven't had a chance to pick up one of Christine's books, I would highly suggest them. She reminds me of Susan May Warren. Christine was another author I was so excited to meet. Susan was a peach to call Christine and find out where she was wandering around at the Mall of America. That place is huge and Christine took the time to find us to sign my copy of her book Along Came a Cowboy. Is that a dedicated author or what?! Another author new to me is T.L. Higley. Her first book Shadow of Colossus was in a time period I've never read before. T.L. 's series will take us through the Seven Wonders of the World. She actually has 2 books coming out this year from this series. The second book City of the Dead comes out in March. Yippy, not a long wait for that. Book 3 Guardian of the Flame comes out in October. I really like not waiting a long time for books in a series to come out. The nice thing about this series is that they're not dependent on each other. They are stand alone novels. I have really been blessed with a great selection of YA novels this past year. Of course that leaves me wanting more, especially when they're series. Again, my 15 yr old daughter and I really enjoyed D. Barkley Brigg's novel The Book of Names. She was NOT happy that I gave the book away on my blog. So, when book 2 Corus the Champion comes out in the Spring, I will be keeping it in our library. 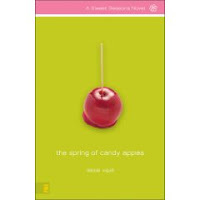 the spring of candy apples is the 4th book in Debbie Viguie's series. I had the chance to read book 3 the winter of candy canes and just received book 1 in the series the summer of cotton candy. Book 3 was the first book in the series and Debbie's first book I've read. This was great teen lit! I hope Debbie keeps up with this genre of book. Teen girls need to have encouraging books and Debbie's book certainly fit the bill. If you are looking for books that are full of what they go through in their lives today as well as the faith element, then check out Debbie's "A Sweet Seasons" series! I was introduced to Julie Klassen last year. Her first novel, Lady of Milkweed Manor, was a house favorite. Well, much to my joy, I received The Apothecary's Daughter, last week! This will be the first book of 2009 that I'll have the pleasure to read! What a great way to start off the new year! Julie has a lot of experience in the publishing industry. She works for Bethany House. I hope that since she lives in MN that I'll have the chance to run into her at a book signing. I had the privilege of meeting her at the same time as I met Cathy Marie Hake. They were at Northwestern Bookstore together. Julie was a really neat lady to talk to and the joy in her spirit came shining through. Bryan Davis is rockin'! I searched the web trying to find a cover for the 3rd book in his Echoes From the Edge series so I could add it to my list when I created it the other day, and couldn't find it anywhere. Well, he found me on Facebook today and I believe he knows I'm a huge fan. See, I'm tellin' ya, YA fiction isn't only for YA! I love this series! So, he just emailed me the picture for book 3 Nightmare's Edge. This is such a cool series! So, here's my latest add to my anticipated 2009 reads... Nightmare's Edge by Bryan Davis! I also have to say, he's got really cool covers for this series. You have to look close to see there's more than meets the eye. Oh, I forgot about Maggie Rose! Isn't that the BEST series?? And I've had a chance to read City of the Dead already and it is TOO COOL!!! Ugh, I will not be jealous, I will not be jealous! How lucky are you to have read T.L. 's book already! And I loved the first book in Sharlene's series! I so have to add That Certain Spark to my list! We are anticipating a few of the same books. She is wonderful isn't she. I just love the cover of Maggie Rose, don't you? I also have my eye on 'That Certain Spark' as well.